Craft Suction Pump is developed to provide a smooth low volume suction at a predetermined negative pressure. Suction is activated by a foot operated switch. 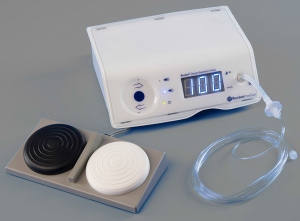 The pump may also be used in other procedures such as endometrial sampling. Range of suction is from zero to 400mmHG and adjustable over the range by a preset control, provided by a quiet diaphragm pump. Supplied complete with foot control, overflow reservoir and silicon tubing with luer lock adapter. Craft Duo Vac Suction Pump incorporates dual air operated foot switches which allow the operator to instantly control standard and high vacuum.Indicator lights located in the front panel are colour-coded—red for high vacuum and green for low.The high vacuum foot switch is mounted alongside the standard vacuum switch but us raised higher to allow the operator to easily distinguish the pedals by feel.Supplied complete with foot control, overflow reservoir and silicon tubing with luer lock adapter. 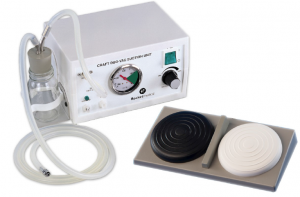 Rocket® Digital Oocyte Aspiration Pump is a new generation instrument, specifically developed to provide smooth, low volume vacuum at pre-determined negative pressures, allowing simple, low turbulence, oocyte recovery. IMMEDIATE VACUUM RESPONSE and CUT-OFF is achieved with digital pump and valve control, giving immediate low vacuum up to 300mmHg-1 and high vacuum to 500mmHg-1. FLASHING PUMP ACTIVE INDICATOR to clearly identify the pump is operational and generating vacuum. AIR OPERATED DUAL TOGGLE FOOT-SWITCH OPERATION reduces operator fatigue by removing the need for constant pressure on a foot switch. High Vacuum is a single click away. UNIVERSAL 12 VOLT SYSTEM for use with 110-240VAC 50/60Hz mains power supplies. FILTER CONNECTION SET with soft, low weight tubing to reduce drag. INTEGRAL SERVICE INDICATOR constantly monitors pump performance and adjusts the service period against pump workload which means the pump is always serviced at the correct interval.